Section 1. The Mayor and Clerk are authorized and directed to execute a special warranty deed, a bill of sale and a release of lease, in substantially the forms submitted to the Governing Body concurrently with the adoption of this Resolution. The Clerk is directed to deliver the executed special warranty deed, a bill of sale and a release of lease to the Tenant. Section 2. The Mayor and Clerk are hereby further authorized and directed to sign such other instruments and certificates as shall be necessary and desirable in connection with this Resolution, and are hereby further authorized to take such further actions as may be necessary to accomplish the purposes of this Resolution. 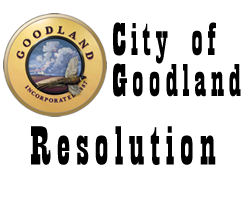 ADOPTED by the governing body of the City of Goodland, Kansas on March 20, 2017.